Capcom has revealed the trophy list for upcoming PSN title Okami HD. The game will feature the coveted platinum trophy as well as a few hidden ones you’ll have to discover for yourself, but are linked to the story mode. 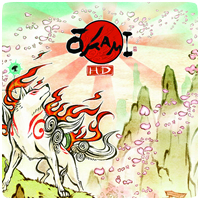 Okami HD will be available this October as a digital download on PSN for $19.99. The game is a HD remate of the original PS2 title, and will feature full PlayStation Move support. Players take on the role of Amaterasu, the Japanese sun goddess, who inhabits the form of a wolf. After a tyrannical monster, Orochi, turns the world into a ruined, colorless wasteland, Amaterasu must use her magical abilities to restore the land to its previous glory and defeat the demon in charge of the destruction. Bronze Yomigami Learn how to use Rejuvenation. Bronze Tachigami Learn how to use Power Slash. Bronze Sakigami Learn how to use Bloom. Bronze Enemy in the Gates Defeat enemies inside of a Devil Gate. Bronze Bakugami Learn how to use Cherry Bomb. Bronze Hasugami Learn how to use Water Lily. Bronze Tsutagami Learn how to use Vine. Bronze Nuregami Learn how to use Watersprout. Bronze Yumigami Learn how to use Crescent. Bronze Kazegami Learn how to use Galestorm. Bronze Moegami Learn how to use Inferno. Bronze To the Moon, Ammy! Enter the Moon Cave. Bronze No Furball on the Menu Make your way to shore without being swallowed by the Water Dragon. Bronze Kasugami Learn how to use Veil of Mist. Bronze Kabegami Learn how to use Catwalk. Bronze Gekigami Learn how to use Thunderstorm. Bronze Itegami Learn how to use Blizzard. Bronze Grab Life by the Leash Increase your Solar Energy, Ink Pot, and Astral Pouch levels to maximum capacity. Bronze No More Fish in the Sea Complete your Fish Tome. Bronze Have Guides Will Travel Complete your Travel Guide. Bronze Give a Dog All the Bones Complete your Treasure Tome. Silver Sniff ‘Em Out Defeat all monsters on the Wanted List. Gold Leave No Chest Unopened Collect all Stray Beads. Bronze All Creatures Great and Small Complete your Animal Tome. Bronze Teach an Old Dog New Tricks Learn all god techniques to fill up your Technique Scroll. Bronze From Imps to Demons Complete your Bestiary. Gold Barking Up the Cherry Tree Earn a Cherry Tree rank for each item in the Total Results screen. Bronze Lupine and Divine Earn a Cherry Tree rank for each item in the Results screen. Silver Out of the Gate Swinging Defeat all enemies at all three Devil Gate trial caves. Gold Who Let the Dogs Out? Defeat the Kusa 5. Bronze Dog Eat Dog Beat Hayabusa’s turnip-digging record. Bronze Diggin’ It Complete five digging mini games. Bronze Eat My Flower Trail Win the race against Ida and Hayate. Bronze Dog Gone Fast Win the race against Kai. Platinum Top Dog Acquire all trophies.